My name is Andy Turner and I’m a 3D artist by day and also run the site Korple by night. I’ve designed and produced some new end cheeks for Electron units that have a folding leg design that allows you to angle your instrument while playing but then folds away for storage or transport. I’ve produced a small number of them to see if people like them and if there’s sufficient interest I’m going to look into getting a larger batch of them produced. At the moment I produce them myself with 3D printing tech but this takes too long to make large numbers. Sloping design only on A4? Does the machine still fit in the original Elektron ecc bag with mounted cheeks? Good stuff. The title put a smile on my face. Bookmarked. As soon as I have some more income I’ll be buying a pair. Received mine today and shall fit them shortly. They look great! Ordered for my OT! Spotted these on Facebook recently and was hoping they’d become available. Will see how I like them but chances are, I’ll get another set for my A4. Any chance you’ll make these for digitone? The Swingcheeks come with optional spacers that allow the fitment of the PL-2 cover. Afraid these won’t fit the case for the Digitone (or Digitakt etc.) because there’s no rack mounting screws on the side. Not sure about that pmoldzio, I don’t have access to one to check. I know I asked in my message if you could feasibly modify the design so that it didn’t need them! The reason I haven’t done it is that if I need to ramp up production I don’t want to have a piece with any undercuts so that I can get them machined. That means I can get the cheeks cnc machined out of plastic easily and the spacers could be laser cut. 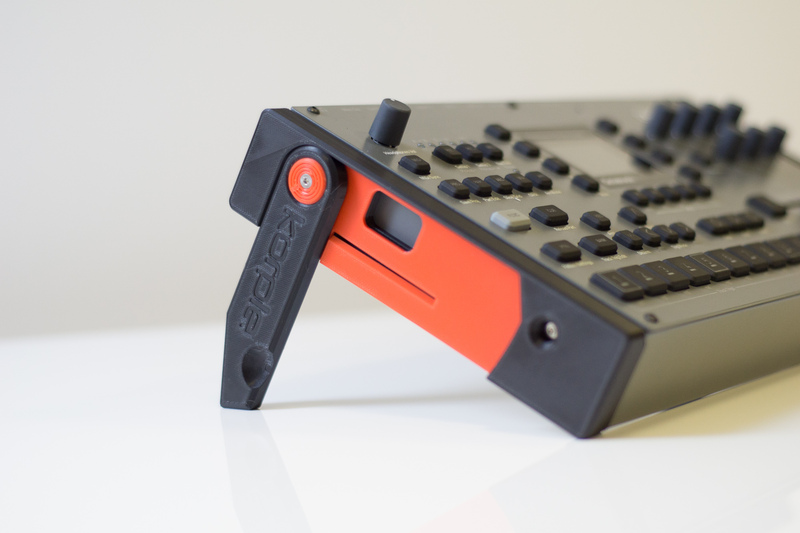 Understood, I was thinking maybe a design similar to the volca boxes you make, with a lower panel (to screw into the vesa mounts on the backside of the unit) and a bottom/front cheek for stability, leaving the back open for connections. Wood would be particularly appreciated, but no matter, that’s getting rather complex already! Lid fits with spacers fine but EEC-3 bag is a no, too long with end cheeks. Looks like the orange-red ones are sold out. As soon as they are back in stock count me in for a pair with spacers for a lid. I was just looking for end cheek options last night and this folding design is exactly what I’m after. Would love to see some with a slightly less steep angle.